Another of my attempts to make custom figures, this time in 3.75″ scale. 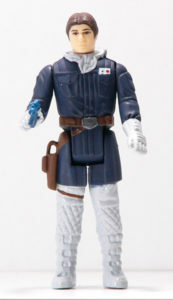 Basically, this is just a Kenner Hoth Han Solo figure with a Bespin head. I bought beater figures on ebay for a few bucks each, swapped the head, and did a repaint. It’s interesting to me how much detail was sculpted into the classic Kenner figures that wasn’t painted. For more info on how I put this figure together, see HERE.